Helm: I found this film crushingly disappointing. Mathew: It wasn't that bad. Helm: So you keep insisting, but I did not like it. Mathew: You've got to get over your fear of talking monkeys and dolls and things. They're just special effects. Helm: That had nothing to do with anything. Although, the monkey and doll were freakishly real to the point that anyone might have questioned whether they were demons rather than computer generated effects as you suggest. Mathew: Nope. No one worries about that crap but you. Helm: Either way, I was saddened by this film. I wanted to like it for so many reasons. Mathew: I'm telling you, you just went in with your expectations set too high. Helm: My expectations were high, I confess. 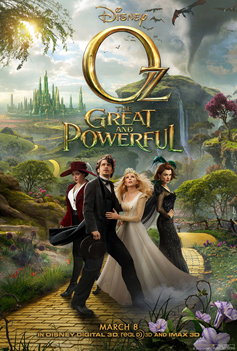 Given that this film is a sequel to the amazing 1939 Wizard of Oz, that it was directed by the visually inventive and ingenious Sam Raimi (who previously made the Evil Dead films, the under-recognized Crime Wave and the awesome western The Quick and the Dead) and that it features James Franco, who I continue to wish had been drafted as my Valhalladrim rather than you, yes, I was hoping for a lot. Mathew: No film can live up to that kind of pressure, dude. Helm: Actually, there is a kind. It's called a GOOD FILM. Unfortunately, this was not one of those. This was passable at its finest moments and very bad at its lowest moments. Mathew: It wasn't as bad as all that. The 3-D was awesome and the performances were good. Helm: The 3-D was beautiful in many places, I grant you, but it was not a substitute for effective storytelling. And yet, it was used as a substitute for long stretches of the film. The tornado, the introduction to the land of Oz. These moments sucked wind. Mathew: I think Raimi was going for a kind of old-fashioned, gee-wiz kind of feel with that stuff. It was like... an homage. Helm: An "Ohh-majh?" You malagrugrous jollux! It was excessively boring and not all that well done. Mathew: Okay, but the story was good and the acting was good. Helm: Actually, I did not find the story particularly inventive, surprising or engaging. In fact, it seemed fairly predictable--almost formulaic. And as to the acting, some was good and some was... fairly odd. Mathew: You're talking about Glinda, aren't you. Mathew: Yeah, kind of an odd choice. Makes you wonder if that was Michelle Williams' idea or Sam Raimi's. Helm: It makes me wonder if anyone was watching the dailies. Mathew: Okay. But the monkey and the doll were funny and endearing. Helm: When they were not creeping me out, yes. Of the two, I think the doll was the standout. Helm: I cannot truly recommend this film, either for adults or children. With the exception of a few moments, it was just... blah. Mathew: I think that film buffs, like myself, will be able to appreciate it for its nuanced elements and visual panache that a helmet, like yourself, might overlook. Helm: I think that pretentious pettifoggers, like you, might enjoy it more than intelligent viewers with reasonable expectations, like most everyone else. One and a Half Flaming Swords!! Helm: That is a ludicrously high rating for this film. Helm: You are only rating it so highly because of the girlish crushes you have on Sam Raimi and James Franco. Mathew: No, you have crushes on them.